U.D. asks: Can you tell me something about the value of this error? Multiple struck State quarters bring between $500 and $1,000 depending on the venue in which you offer it. 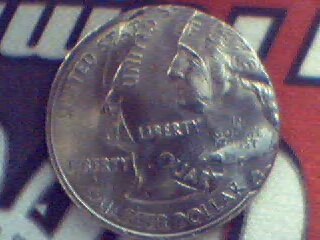 Note that this price is far more than pre-1999 double struck clad Washington quarters which only bring about $80-$100. You might try something like eBay to sell it. Sharon P. asks: When was the last year a Jefferson nickel was made of silver? Jefferson nickels are made from planchets that are 75% copper and 25% nickel and weigh 5 grams. This composition has been in continuous use for regular nickel coinage since 1866. The only exception to this was the war years of 1942-1945 where nickel was needed for the military. The change of composition was signified by a large mint mark over Monticello on the reverse. The emergency alloy was 56% copper, 35% silver and 9% manganese. The original copper-nickel composition was resumed in 1946 and continues today. Vincent F. asks: What do the letters “VAM” stand for in the description of a Morgan dollar? VAM” or “Van Allen and Mallis” numbers represent the Morgan Dollar die varieties identified by Leroy Van Allen and A. George Mallis in their book The Comprehensive Catalogue and Encyclopedia of U. S. Morgan and Peace Silver Dollars , Arco Publishing Company, NY 1971, 1976. 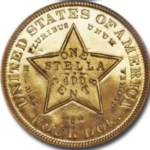 James B. writes: I’ve recently purchased an 1883 Proof Indian Cent and upon close inspection under a jeweler’s loupe the obverse lettering (including the Liberty on the headband) are staggered/stacked. I’m new to this hobby, but from my investigations on the net , it appears the coin is a “double-die”.. Is it possible for this to occur in a proof?, if so, what about it’s value if indeed it is a proof double-die. Thanks for your time. A doubled-die is an improperly made die where subsequent strikes from the master hub are rotated out of line with the original strike. All coins struck from this defective working die show the same doubling error. 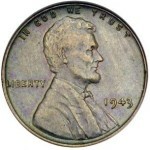 A good example of a doubled die error is the 1955 doubled-die cent. One obverse die had a severely out of alignment hub doubling causing a very spectacular error. All coins that were struck from this die exhibited this error. Fortunately, the Mint workers missed this bit of quality control which has supplied the hobby with something quite exciting. Note that other obverse 1955 dies were normal and struck normal 1955 cents. Most likely only one die was made to strike the 6,609 1883 proof Indian cents and since this die wasn’t a doubled-die, your doubled lettering has another cause. Proofs are struck on specially prepared planchets and are generally in higher relief than business strikes because they are struck more than once. If the collar that holds the coin in place when it is struck is loose then the planchet will move slightly when it is struck causing a slightly doubled image on part or even all of that coin. “Strike doubled” coins are unique and are not the result of a defective die. This type of manufacturing defect is usually minor and requires a loop to see it. The characteristic look of this type of doubling is often called “shelf doubling” because of the shelf like appearance of the lettering. Doubled-dies show distinct separation of the doubled areas. Shelf-doubling rarely brings a premium above the price of a normal coin. One characteristic to look for on 1883 proof Indian cents is the presence of a repunched “3” in the date. This may have been done as a bungled attempt by a mint worker to strengthen the digit. Only a small number of 1883 proofs with repunched “3” exist. If you discovered this characteristic on your coin it would add value as this is a rare variety. The 1777 $5 note was part of the seventh issue of “Continental Currency” issued by the Continental Congress and was a failed attempt at creating a viable banking system. The $5 issue is dated May 20, 1777 and was printed by Hall & Sellers in Philadelphia. Values depend on grade (condition). Approximate range: US $10 – $600. Your inheritance is worth quite a bit. Proof dollars are very rare and valuable especially the 1803 where only a handful of proofs exist. I suggest getting them graded and placing them in an appropriate auction. See the CoinSite Links page for third party grading services. No 1980 Philadelphia quarters have been reported struck on 90% silver planchets. In order for that to happen 90% strip would have had to exist at the mint in 1980. Rolls of prefabricated metal of the proper thickness and material are run through a machine that punches out planchets of the proper size. Since no 90% silver strip was available at the Mint in 1980 it would be difficult to create 90% silver quarters. 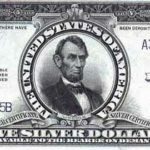 If such an error occurred there would be thousands of silver 1980 quarters in circulation. 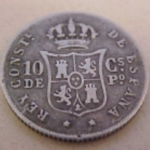 I’m do not know what method you used to determine that the coin was struck on a 90% silver planchet but there is an easy way to tell. There is a substantial difference in weight between a copper-nickel clad quarter and a silver one. If the weights indicate that you have a 90% or 40% silver quarter, it would be currently, the only one known with the date 1980 and I imagine it would be quite valuable. If the weight checks out, you should have the coin certified by a third party grading service such as NGC or PCGS. See their links on the CoinSite Links Page. Chris P. writes: I have a North Carolina $2 from 1861. I am looking to find more information about this bill. The front side has a hand written signature (looks like Henry Hardie) and serial number 41-22. 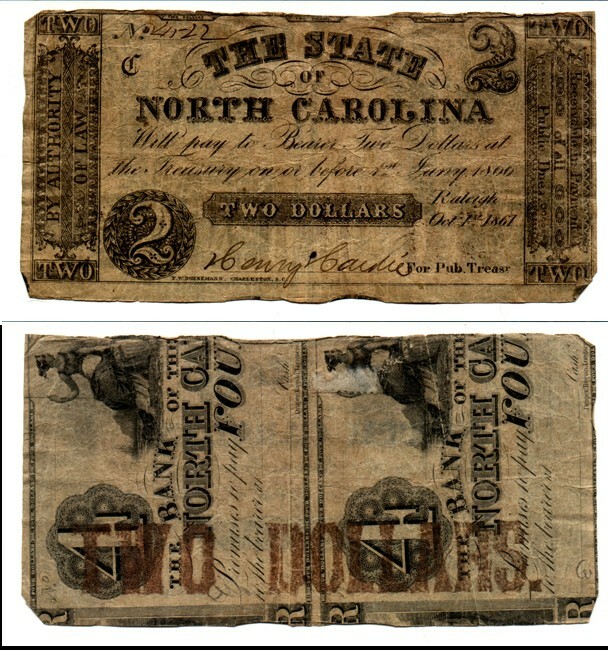 It says “The State of North Carolina will pay to bearer two dollars at the Treasury on or before 1st Jany. 1866. Raleigh Oct 1st, 1861.” At the bottom is the printer info: F.W.Bornemann, Charleston, S.C. The curious part is the back of the bill. 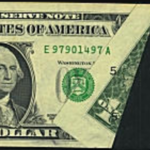 There are two halves of $4 printed sideways, with Two Dollars stamped across in red letters. Please let me know if you have any information on this bill. This note is commonly collected by Confederate States bank note collectors and examples are often available in the market, in the condition shown in your image, at approximately $14-$25.